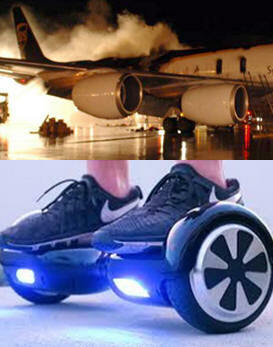 December 11, 2015 - On Friday, four major airlines banned the popular "hoverboards" from being carried or stored on their aircraft. These self-balancing devices are the year’s hottest electronics as people everywhere are snapping them up and buying them as presents for their loved ones. In fact, you probably know at least one person with a hoverboard on their Christmas list, the four carriers are American, United, Delta, British Airways and Alaska Airlines. As cool as they are, there’s one big problem, they are not safe to transport on an airplane. Hoverboards are usually powered by lithium ion batteries, which are regulated by the Federal Aviation Administration (FAA) as hazardous materials. Internal short-circuits can occur with lithium ion batteries, which can then lead to a “thermal runaway” where the battery overheats and bursts into flame. In a statement, Delta said that it had "reviewed hoverboard product specifications and found that manufacturers do not consistently provide detail about the size or power of their lithium-ion batteries. This investigation revealed devices often contain battery varieties above the government mandated 160 watt hour limit permitted aboard aircraft." Back on February 7, 2006, a UPS Douglas DC8 (N748UP) on final approach for Philadelphia International Airport had reported to ATC that a smoke detector had activated in the cargo hold. Flight 1307 landed and taxied to its gate when it caught fire, the aircraft was destroyed. It was years later that it was determined that its cargo manifest included lithium-ion batteries which caused the fire. On September 3, 2010, a UPS aircraft, a Boeing 747 had departed Dubai International Airport for Cologne Bonn Airport. Shortly after departure, the pilot radioed ATC to report smoke in the cockpit. UPS Airlines Fight 6 was vectored back to Dubai International Airport. However, due to the amount of smoke in the cockpit the pilots were unable to see their instruments and the aircraft crashed killing its pilot and copilot. The NTSB investigated the crashed and learned the cargo manifest indicated it was carrying lithium ion batteries which caused the fire which resulted in the crash. As a result, the FAA established strict rules on the carriage of lithium ion batteries as well an examination of safety procedures protecting airliners from cockpit smoke.